Due to track reconstruction, the underground operation on Line A in the Depo Hostivař – Náměstí Míru section will be suspended in both directions from Saturday, the 16th of April 2016 (from the launch of operation) to Sunday, the 17th of April 2016 (to the end of operation). 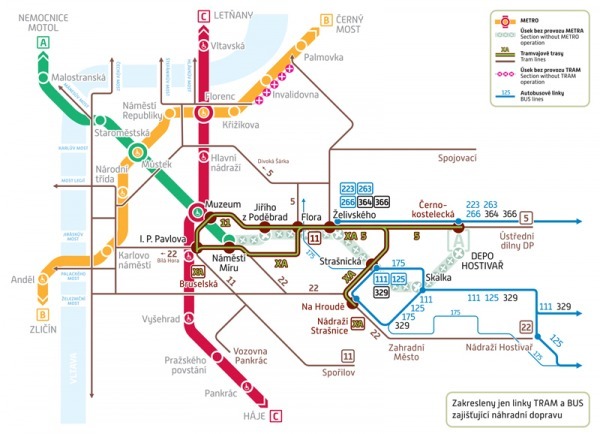 A replacement tram service line XA will be established in daytime operation on the route Bruselská – I. P. Pavlova – Náměstí Míru – Flora – Želivského – Strašnická – Na Hroudě – Nádraží Strašnice (the departure stop Radošovická). Line No. 5 on the route Divoká Šárka – Nádraží Veleslavín – Bořislavka – Dejvická – Hradčanská – Malostranská – Náměstí Republiky – Hlavní nádraží – Olšanské náměstí – Flora – Želivského – Černokostelecká – Depo Hostivař – Ústřední dílny Dopravního Podniku. Line No. 11 on the route Spořilov – Náměstí Bratří Synků – I. P. Pavlova – Muzeum – Jiřího z Poděbrad – Flora – Olšanské hřbitovy. The I. P. Pavlova stop on Tylovo Square is established for the period of the suspension in both directions for daytime lines no. 11 and XA. Lines no. 111, 125 and 329 from Skalka have their routes extended via the Na Hroudě stop (change for tram line XA) to the Strašnická stop, where they terminate. Lines no. 223, 263, 266, 364 and 366 from Depa Hostivař (in Černokostelecká Street) have their routes extended to Želivského, where they terminate (the lines do not drive to the Depo Hostivař depot). Positions of the low-floor connections of the above mentioned extended bus lines are changed. Recent information is available at Find Connection. Line No. 163 does not drive to the Depo Hostivař depot. Line No. 175 is, on its regular route Sídliště Petrovice – Florenc, reinforced in the Skalka – Strašnická section. Several kinds of informational leaflets will be issued in a total number of approximately 25,000. The leaflets will be available in racks in the underground stations, as well as in the surface transport vehicles or in the informational showcases of the underground stations. For the period of the suspension, daily (from cca. 8.30 a.m. to cca. 8.00 p.m.), approximately 12 information clerks with the reflective vests will be deployed in the area of the underground suspension and its vicinity. They will be ready to advise passengers on current public transport connections (not only in Czech, but also in English). The information clerks will also be equipped with the aforementioned informational leaflets for passengers. Starting already on Monday, the 11th of April 2016, the informational leaflets with basic information on the upcoming suspension will be placed in racks in the underground stations and will be available for passengers during the suspension period as well. From Wednesday, the 13th of April 2016, the upcoming suspension will also be announced in the underground stations. The announcements will continue during the suspension as well. Approximately 55 information boards with a schematic diagram and basic text information in Czech and English language will be arranged to provide the information related to the specific destination.